HeatmapTool.com is the best online service for creating spectacular and accurate representations of your data. A heat map allows you to quickly visualize spatial data using a range of colors, and when combined with the power of the Google Maps API, visualizing location information has never been easier. 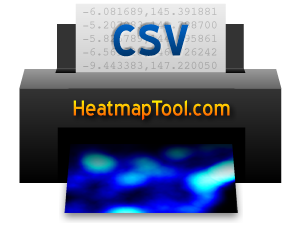 Simply provide HeatmapTool with the URL to a comma separated values file (CSV) that includes the latitude, longitude, and (optionally) amplitude. Set any of the many options we have available, such as the size and color, and we'll send back your customized heat map image within seconds. It's never been easier. Learn more about what makes HeatmapTool better than any other heat map service, and when you're ready to start making heat maps with your own data, sign up for your free registration key.